Veteran race announcer and long-time roadie Jamie Smith sets out to explain the sport he loves and the roadies who live for it in his new book from VeloPress, Roadie: The Misunderstood World of a Bike Racer. With help from the pen of nationally syndicated cartoonist Jef Mallett, Roadie celebrates cycling as it explains the neurotic tendencies of the sport and its lifestyle, from shaved legs and garish jerseys, to garages full of bikes worth more than cars. Perfect for roadies and their confused friends, family, and co-workers, Roadie puts an end to the head scratching and leaves roadies laughing out loud as they revel in their misunderstood world. 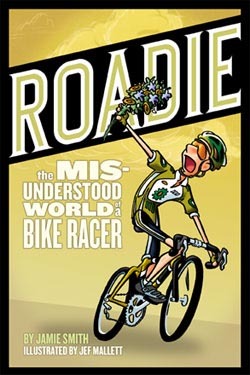 Roadie is now available in bookstores, bike shops, and online at VeloGear.com. Roadie begins by explaining the lifestyle of a roadie, or bike racer, through the staples of a roadie's life: devotion to the sport, the bike, the training ride, nutrition and bonking, and more. Smith moves on to "classroom sessions" about drafting and the breakaway, sprints and temporary alliances, and crashes. Smith explains the rituals of race day, the referee and race rules, and the tenuous relationship between rider and sponsor. Finally, Roadie explores cycling's race formats and how friends and family can get involved in their Roadie's favorite pastime. Roadie is needed more today than ever as more Americans take up cycling as riders, racers, and spectators. The New York Times has called cycling "the new golf" and thousands of people are buying shiny new road bikes each year. For these recreational and fitness riders, Roadie offers a much-needed primer on the lingo, the gear, even the politics of a group ride. Pacelines, drafting, sprinting, climbing, and breakaways are turned into everyday commonsense with colorful anecdotes. Millions of Americans watch the Tour de France during the month of July and the U.S. is now host to its own major stage races like the Tour of California, Tour de Georgia, Tour of Missouri, and Tour of Utah. In fact, bike racing is all over America, with shorter race events like Pennsylvania's Commerce Bank Triple Crown, South Carolina's USPRO Championships, Wisconsin's Superweek, and dozens of regional criteriums attracting thousands of racers and spectators. USA Cycling, the governing body of bike racing, reported an all time high in annual memberships for 2007 (which means record numbers of perplexed friends and family!). Roadie is perfect for those who have ever walked away from a bike race completely puzzled, explaining strategy for each race format and how best to watch the action from roadside. Roadie brings the excitement of bike racing alive for anyone with an appetite for adrenaline. Author Jamie Smith has been a bike racer since 1983 and a bike race announcer since 1985, working his way up through the ranks of amateur cycling and traveling with some of the world's greatest cyclists. When he's not on his bike, Jamie Smith is a public information officer and photographer for the City of Rochester Hills in Michigan. More about Jamie is available at his website ThatsBikeRacing.com and his blog RidersReady.net. Illustrator Jef Mallett launched his "Frazz" comic strip in 2001 and it now runs in 150 newspapers nationwide. An avid cyclist and frequent triathlete, Mallett writes a monthly column for Inside Triathlon magazine and contributes to VeloNews magazine. As a working bike race announcer, Jamie Smith is available for "Roadie Happy Hour" author events in conjunction with major U.S. races in Georgia, Missouri, Wisconsin, Pennsylvania, Indiana, Illinois, and South Carolina.